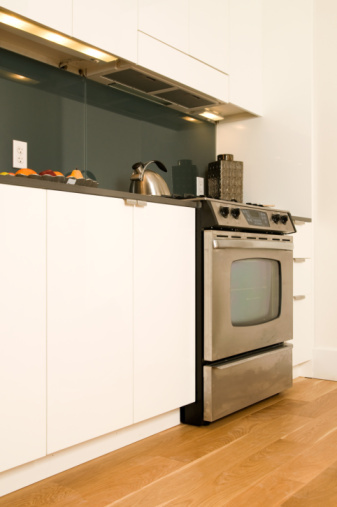 Cabinets are not typically free-hanging or suspended from the ceiling. However, there are kitchen designs that call for cabinets to hang over a center island or a peninsula. You can do this with additional support in the ceiling's frame and to the top of each cabinet. You need accurate measurements to properly locate the area in the ceiling to reinforce, as well as a few basic tools and the help of an assistant. With proper support, cabinets can hang from the ceiling. 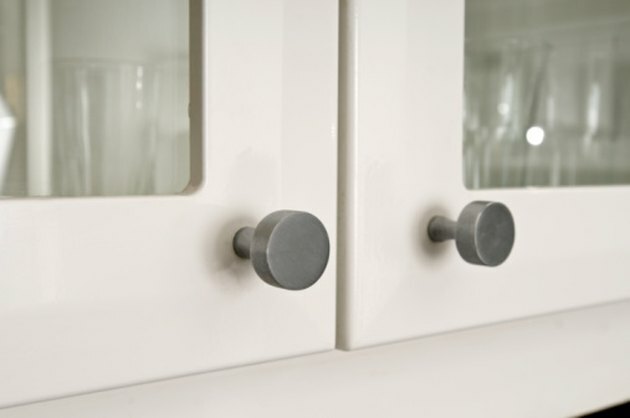 Unscrew the cabinet doors from their hinges and remove the doors. This makes the cabinets easier to handle. Hold the cabinets up against the ceiling in the desired location with the help of an assistant. A cabinet support stand can make this step easier. Mark the outline of the cabinets on the ceiling with a pencil. Set the cabinets aside. Run a stud finder tool across the outlined area and mark the location of the ceiling framing boards or rafters. Drill holes through the drywall and into the attic or crawl space. Drill the holes at the corners of each cabinet's outline and a couple of places around their edges. When in the attic, this helps you locate the area where you will hand the cabinets. Crawl into the attic area and locate the reference holes. Position 2-by-4-inch lumber between the rafters and over the holes that indicate the cabinet edges. Attach the lumber to the rafters with a hammer and nails to reinforce the ceiling's frame. Screw plywood to the top of the cabinets for added support. This helps them withstand their weight plus the weight of their content. Position one of the cabinets up against the ceiling within its reference outline. Hold a carpenter's level along the bottom of the cabinet to ensure it is level. If necessary, insert shims between the cabinet and the ceiling and trim any excess shim with a utility knife. Attach the cabinet to the rafters and the new frame supports with lag bolts, washers and a socket wrench. Be sure the bolts go straight up into the support boards. Position the second cabinet next to the first with the faces of each are flush with each other and then clamp them together. Check it for level and attach it to the rafters with lag bolts and washers. Screw the cabinets to each other using 2 1/2-inch wood screws. Remove the clamps. Screw the cabinet doors back onto the hinges.